Access to clean drinking water is critical to human survival and is an essential ingredient to improving the lives of millions of people in the developing world. According to UNESCO, more than one billion people in the world do not have access to clean water. Water related diseases are the leading cause of death in the world, taking the lives of 6000 people a day. 40 billion hours are spent annually hauling water, a chore primarily undertaken by women and girls. We all know that Crooked Tree Village is blessed with plenty of water, but in the dry season, the lagoon evaporates to less than half the size and the lack of rain and low ground water levels can cause severe water shortages. I know many of you will recognize this well, but do you remember who dug it? In 1964 Crooked Tree had two community water wells, one in the “Staine” area and the other in the “Pine Ridge” area. There are several stories going around about the construction of the water well in the Staine Area, the “Pine Ridge” water well is no longer in existence, so we will leave that alone. First, let’s start with the land. 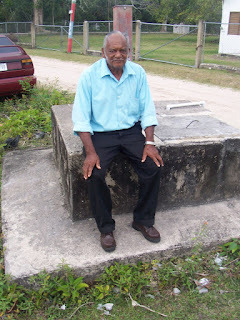 According to reliable sources, the land where the Crooked Tree Village Community Center and the Stain Community Drinking Well was bought from Mr. George Belisle for BZ$90., Mr. Belisle is the father of Denton Belisle, City manager of Belmopan, Belize. A contract was given to Mr. Percy Flowers, the only mason in the village at that time and he hired Mr. Robert "Bob White" Tillett with his sons, Winfield, Murvin, Clarence and the late Burton Tillett to dig the well by hand. The well was dug to about 30’ and has been renovated from time to time. Today, this well is still functioning and a few families are still drawing water from it. The people of Crooked Tree Village appreciate the work of Mr. Robert Tillett and sons. This brings back a lot of memories. I can remember in the dry season the Pine Ridge well would go real low in the day time because of the lot of usage. I remember we had to get up before day (real early in the morning) and go out there in the dark to get water because during the course of the night the well would get more water. I used to wait for Earl, Howard, Roosie and Mike to yell out when they were passing by Hessie and Codd house to go get water and if we were lucky we would make three trips before the water would run low. We've come a long way since then. Love this story Linda. I remember washing my foot at the well when going to staine to sell pear, and my foot would be so dusty.